If you're gonna use a red so bold it looks like fire, your product better deliver. 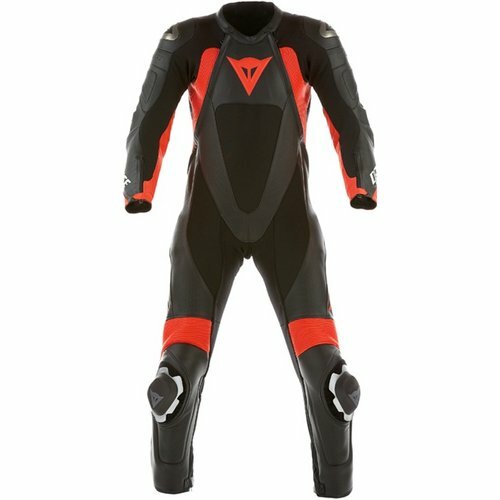 The brand new for 2010 Dainese Red Line Racing Suit absolutely does. This suit is across-the-board quality and, in our opinion, primo at its $1499 price. Hit the track! 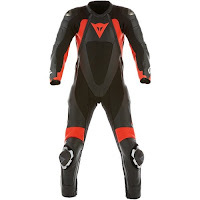 Bursting out like a hot ball of lead, the 2010 Dainese Red Line is packed with features. The video above digs really deep into what's got us going about the suit, so I'll just scratch the surface here. This is in Dainese's upper echelon of motorcycle racing suits, which means no expense was spared. First off, D-Skin leather, Dainese's proprietary leather, is a massive safety upgrade over traditional cowhide. Using special silicone and wax treatments, the leather has a much softer and more supple feel. More important is the protection: 60% greater tensile strength (lateral tear) and 80% greater abrasion-resistance (road-sliding) than regular cowhide. That's a pretty serious upgrade. The next major feature is the 3D Bubble Liner, which creates air pockets between the three dimensional extrusions in the liner. This in turn creates air pockets resulting in microclimate at your core. The body's desired temperature will then be maintained, insulating you from outside hot or cold variables. 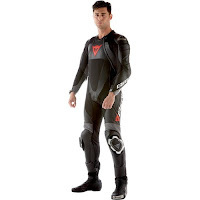 For ease of getting in and out, Dainese utilized a W-frame construction, with double zips at the chest, offering added comfort and flexibility. On the same note, S1 Stretch Panels can be found throughout the suit for on-bike mobility. Also, you'll have co-injected titanium sliders on the shoulders with Dainese's knee sliders atop the standard CE rated internal armor. I almost forgot, it also has a water bag built into the speed hump. Like I said, across-the-board quality. We're super-high on this suit based on all the features and functionality we see at this price point. 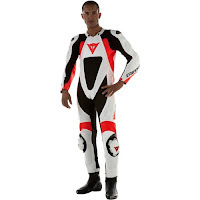 If you want to compare their line-up, check out all the Dainese Racing Suits at RevZilla. We'll be rolling out reviews of them shortly.